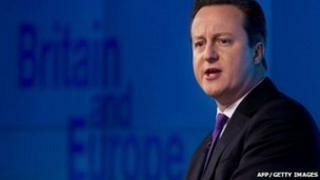 David Cameron is losing control of his party over Europe, former Conservative cabinet minister Lord Howe has said. The Tory leadership is "running scared" of its MPs by offering to renegotiate the UK's relationship with Brussels, he said in the Observer. He warned of the "grave effect" of leaving the EU on the UK's influence. But Health Secretary Jeremy Hunt said the party was "united" on the need to change the relationship and the prime minister was "showing leadership". Lord Howe's warning comes amid press reports that a figure close to Mr Cameron called grassroots Conservatives pushing for an EU referendum "mad, swivel-eyed loons". No 10 denied "anyone in Downing Street" had made the remarks, while party co-chairman Lord Feldman said he was taking legal advice over "untrue" web rumours he had made "derogatory comments". Lord Howe resigned from Margaret Thatcher's government in 1990 over her policies towards Europe - his resignation speech is seen as having sparked a chain of events that led to the end of Baroness Thatcher's premiership. Writing in Sunday's Observer newspaper, he said Mr Cameron had "opened a Pandora's box politically and seems to be losing control of his party in the process", over his plan to renegotiate the UK's relationship with the European Union. Media captionLord Howe: "Our presence there (in EU) gives us influence throughout the world"
"The ratchet-effect of Euroscepticism has now gone so far that the Conservative leadership is in effect running scared of its own backbenchers, let alone UKIP, having allowed deep anti-Europeanism to infect the very soul of the party," wrote Lord Howe, a former foreign secretary, chancellor and deputy prime minister. "The Conservative Party's long, nervous breakdown over Europe continues and what is essentially a Tory problem is now, once again, becoming a national problem. "Serious mistakes have been made, but the situation is not irretrievable." A "mixture of clear thinking, strong leadership and an overriding concern for the national interest, not party management or advantage" was needed, he said. But Conservative MP John Redwood told the BBC Eurosceptics wanted the "new relationship" with Europe that the prime minister had started to set out and were happy with his policy of "negotiate and decide", they simply wanted him to "get on with that negotiation". He said only a "handful of people in the Conservative movement" who thought the UK's current relationship with Europe worked while the rest of the party was "united behind the prime minister". Mr Hunt told BBC One's Andrew Marr Show: "If you look at the substance of the issue, the Conservative Party is absolutely united. In a separate interview with BBC Radio 5 live, he warned of the possible consequences of an in-out referendum on the UK's relationship with the EU. "If the result of such a referendum was to suggest our detachment from the EU, it would be of grave effect, because our presence there gives us influence throughout the world," he told the Stephen Nolan show. The success of the UK Independence Party, which campaigns for Britain's exit from the EU, in English local elections earlier this month prompted Eurosceptic Tory backbenchers to increase pressure on Mr Cameron to hold an in-out referendum on the UK's membership. The Conservatives last week published a draft parliamentary bill to legislate for a referendum to be held by the end of 2017 - it is being taken forward by a Tory backbencher as the Liberal Democrats will not allow it to be introduced as a government bill. Last week 116 Conservative MPs backed an amendment to the Queen's Speech "regretting" that it did not mention a referendum. The row is continuing over claims in several newspapers that someone with "strong social connections" to Mr Cameron described Tory grassroots Eurosceptics as "mad, swivel-eyed loons". No 10 said it was "categorically untrue that anyone in Downing Street made the comments about the Conservative Party associations and activists reported in the Times and the Telegraph". Party co-chairman Lord Feldman said in a statement: "I would like to make it quite clear that I did not, nor have ever described our associations in this way or in any similar manner." No 10 said the prime minister "supports Lord Feldman's position". In a separate development, Conservative activists have said Mr Cameron's support for gay marriage has made winning the general election "virtually impossible". In a letter to the PM, more than 30 past and present local party chairmen warned his backing for a change of law had led to voters switching to UKIP.